Winston Churchill’s observation that “good and great are seldom in the same man” found exception in two exceptional men who passed away this last weekend. 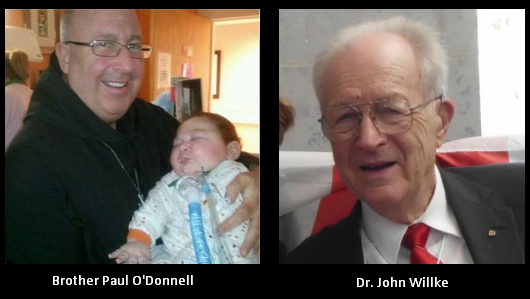 Brother Paul O’Donnell and Dr. John (Jack) Willke both brought the pro-life movement to new heights through their full lives of love and devoted effort. Cincinnati Right to Life (founded by Dr. John Willke and his wife Barbara) tells of his passing. The pro-life movement worldwide mourns the loss of Dr. John Willke, who slipped quietly from this earth Friday evening, February 20, 2015, just two months short of his 90th birthday. His beloved wife, Barbara, preceded him in death April 2013–a soul mate he missed deeply. Dr. Willke was a physician, author, lecturer, TV and radio personality, and expert in human sexuality. Until recently, he served as president of the national Life Issues Institute, headquartered in Cincinnati, Ohio. He served for ten years as president of the U.S. National Right to Life Committee, and helped found the International Right to Life Federation. Dr. and Mrs. Willke co-authored Abortion, Questions and Answers: Why Can’t We Love Them Both; Handbook on Abortion; Abortion and Slavery, History Repeats; Assisted Suicide & Euthanasia, Past & Present; plus six other books on human sexuality, videos, brochures, and more. Their works have been translated in over 30 languages worldwide. Just last month, Dr. and Mrs. Willke’s autobiography Abortion and the Pro-Life Movement: An Inside View was released, chronicling the life of this legendary couple. They were devoted to their children, grandchildren, and great grandchildren, and in all things strengthened by their strong Catholic faith.